He's the editor of a popular Facebook page that provides news from a country with one of the world's worst records on press freedom. But not even the journalists who write for him know his real identity. On the surface, J's life appears fairly ordinary. He has a day job, a family and a football team he follows religiously. But J is also the anonymous editor of the largest page on Facebook reporting news from his home country, Eritrea. According to Reporters Without Borders, only North Korea has less press freedom. The international media monitoring organisation describes Eritrea as "a dictatorship in which the media have no rights". All news outlets inside the north-eastern African country are state-owned, and journalists have been imprisoned without trial or charge. That makes J's page, Eritrean Press, unusual - and perhaps unique. 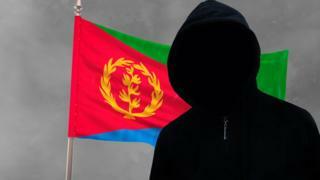 It has more than 250,000 followers, and is independent of the Eritrean government. J lives in Britain, but makes occasional trips back to Eritrea, and he agreed to give his first interview to the BBC on condition we keep his identity a secret. Not even the page's eight volunteer writers - based in Eritrea, Britain and the US - know his real name. "No-one knows who I am," he says. "I'd be in prison." The content on the Facebook page covers the broad sweep of Eritrean life. Alongside politics and satire, there are reports about the national cycling team, human interest stories and posts original art deco architecture in the capital Asmara. It's a mix that on average reaches about 1.25 million people each week. Its address is the slightly misspelled @EritreanPresss, because the page with the correct spelling is an overtly pro-government fake, with a tenth of the followers. It's unclear who runs that page. Most readers of the genuine Eritrean Press are part of the Eritrean diaspora around the world. Although Eritrea has a population of more than five million people, J estimates only around 30,000 of his readers are inside the country itself. It's not because of censorship. Unlike in North Korea, China or Iran, social media is mostly unregulated. Instead, the problem is access to the internet, which is both unreliable and expensive. Barely more than 1% of the Eritrean population has access to the web, according to the World Bank. But J is confident that Eritrean government ministers are among his audience, and he says that he and his reporters are often tipped off about stories by high-ranking officials. Eritrea is a one-party state where dissent is not tolerated. President Isaias Afwerki has been in power since the country gained independence from Ethiopia in 1993. Human rights groups say his government has a long and horrific record of abuses. However, Eritrean Press has not always been highly critical of the Afwerki regime. J says the creation of the page in 2014 was inspired by patriotism and tensions between Eritrea and Ethiopia. He came up with the idea of starting an online news service to help his home country in what he called the "propaganda war". "The Eritrean government is very weak when it comes to media," he says. And so, in its early history, Eritrean Press loyally backed the government's line on Ethiopia. "When your country is threatened then you're bound to support your country," he says, although he also pointed out that the page did maintain some independence, by being critical of the government's failings on domestic issues such as housing. When it comes to foreign policy, however, things changed in July 2018, when the leaders of Ethiopia and Eritrea signed a peace declaration. J says this thawing of relations also freed him up to change the editorial stance of Eritrean Press. "Now that the relationship is back on, we don't need to support the government but criticise (them) on the things they do wrong," he says. "If they do the right thing, we support them. If they do the wrong thing, we criticise them." In a landmark post in October last year, J called for the first time for a change of government. In the post headlined "Nepotist Isaias Has Got To Go", J alleged that the president had appointed his son Abraham as an advisor. J says the source for the story was a high-ranking government official, and the post included a scathing critique. Eritreans hadn't fought and died to win independence from Ethiopia simply to install a president who wanted to pass on power to his family, it said. "We now confidently say that the Eritrean constitution is history as long as the dictator is in power," J wrote. The BBC was not able to verify the nepotism claims and so did not report the story at the time. A spokesperson for the Eritrean government did not answer our question about the claim. What is not in doubt is that the post was a major departure for Eritrean Press. It was such a shift that Eritrean Press readers were taken aback. One of the most-liked comments read: "This page must be hacked". Relations between Ethiopia and Eritrea continue to thaw, but the attitude towards independent media shows few signs of changing, at least for now. A government spokesman declined to comment about Eritrean Press but told the BBC: "People are free to express their opinion". He accused unnamed people with a "regime change agenda" of spreading "ill content" online. For now, Eritrean Press occupies an unusual niche - a freely available independent media outlet aimed at a country where there is virtually no press freedom. J says he will continue to publish on Facebook, and that he now counts himself as one of the president's opponents. He says: "I believe there should be free elections, but that will not happen, so the president has to go. Simple as that." Do you have a story for us? Email BBC Trending. More from Trending: Before 'distracted boyfriend', was there 'distracted girlfriend'?